Here’s another one of those basic recipes that doesn’t take much to make. 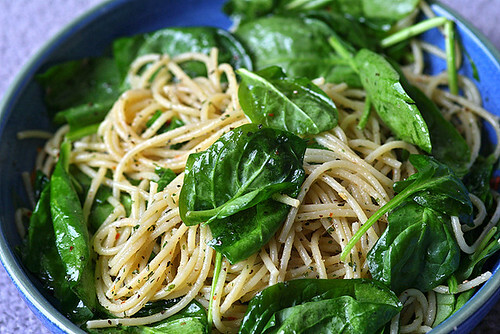 Just garlic, EVOO and spinach… and your lunch is good to go. It’s fantastic! The spinach was added since I had some leftover from last week’s salad. Meanwhile, sweat garlic with EVOO and red pepper flakes in low heat until flavor is fully released, 10 minutes or less. Be sure to not burn the garlic, so keep watch. When pasta is cooked, drain and quickly combine with garlic and oil mixture and spinach and toss well. Sprinkle with grated parmesan and finish with a drizzle of fresh EVOO. If I had a lemon, I would’ve squirted a little juice on it, too. Maybe next time. Oh wow, what a lovely recipe. This look great and sounds even better. I want this now!